Are you looking for the most unparalleled deals on flights with Turkish Airlines? If yes, then you have reached the right place. Turkish Airlines is the national flag carrier airline of Turkey, which is headquartered in Istanbul. At the Skytraxâ€™s 2012 World Airline Awards ceremony, it has been honoured again with accolades of Best Airline in Europe in 2012 and Southern Europeâ€™s Best Airline. 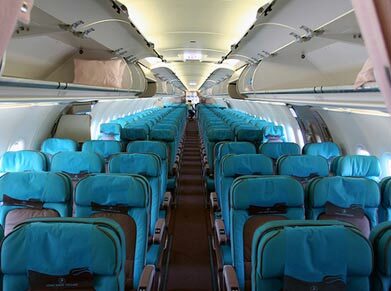 It has also won an award for the Best Premium Economy Class Airline Seat in the world. The airline has found a unique way to provide you an incredible and pleasurable flying experience that you will relish right through the duration of your flight. The Turkish Airlines takes to the air from Manchester, Birmingham, Edinburgh, Gatwick and Heathrow airports. It operates scheduled flight services to 41 domestic and 159 international destinations that serve a total of 200 airports in Asia, Africa, Europe and the Americas. The Turkish Airlines is constantly making every attempt to provide the best of its services and it emphasizes more on its mission so that it can become the admired leading European air carrier with an international network of coverage. It firmly stresses on the customer satisfaction to attain a level of excellence that is simply incomparable. You have the privilege to indulge yourself in the Planet digital system and in-flight entertainment on the airlines’ international flights. Browse through the news channel to update yourself with the current affairs. Travellers going up in the air with Turkish Airlines’ Economy Class can expect to have a time of their lives as the airline provides an ultimate level of comfort, which will transform your journey into a pleasing one. How does it feel to fly with the Europe’s best airline? Feels incredibly amazing, doesn’t it? You are provided with a plethora of amenities that would make you choose to travel with Turkish Airlines for a second time. Grab a laid-back experience with a maximum seat recline of 6 inches. Relax your feet on an adjustable footrest that is available for added comfort. You can take your taste buds on an exciting journey as the meals are served on trays using melamine dishes. You can ask for hot meals that are served on porcelain. Grab a wide variety of alcoholic and non-alcoholic drinks and beverages. Travelling in Economy Class is truly worth as you can acquire an access to the in-flight connectivity that enables you to send and receive text messages and e-mail as well. You can get your ears on news, films and short programs if the duration of your flight is more than two hours. Keep a track of what’s going around in the world with the news channel that offers world news that include economic, financial and celebrity news. Those who choose to fly with Turkish Airlines’ Business Class are treated with courtesy and they are given a royal touch of elegance. You must be among a few privileged ones for having chosen the Business Class as it provides a matchless level of magnificence. Come and fly with the Europe’s best airline and feel the difference. Flying in the Business Class in itself is an incredible experience as the seat includes ottoman that creates a 75 inch long sleeping space when the seat is changed into fully reclined bed position. You can take an advantage of reading light which is located underneath the Armrest services. You would be offered a hot towel as soon as you’re seated. How’s it sound to gulp vintage Champagne? Sure it would put you in a hypnotic effect. Also, fresh orange juice is presented as one of the Welcome Drinks. You can choose mezze and hors d’oeuvres which are prepared according to Turkish and World Cuisine recipes. Get pleasure from the Planet digital system which is available on a few selected aircrafts. You can also watch take-off and landing on two cameras which are mounted at the front and back of the aircraft.